“We have been extremely pleased with the Patton products we purchased from you. 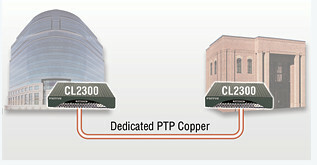 We are currently using the CopperLink 2160 pair to connect 2 of our locations. Previously, we were using a wireless link that would get about 5 MBPS usable throughput. We had continuous headaches involved with rain fade and such degrading the wireless signal. The CopperLinks have now been in place about 7 months and we have had zero issues with them. They are a rock solid product and blow our wireless away. We still have the wireless installed as a backup link, but have not had to use it yet! We are currently running multiple VLANs over the CopperLinks, including VoIP, getting about 12 MBPS throughput without a single issue. LET US HELP WITH YOUR PROJECT!